Australia Testing Shark-Detecting Drones To Prevent Shark Attacks : The Two-Way The trials in the southeastern state of New South Wales are part of an $11.6 million program to protect beachgoers. Drones send real-time images of coastal waters to an operator using GPS coordinates. 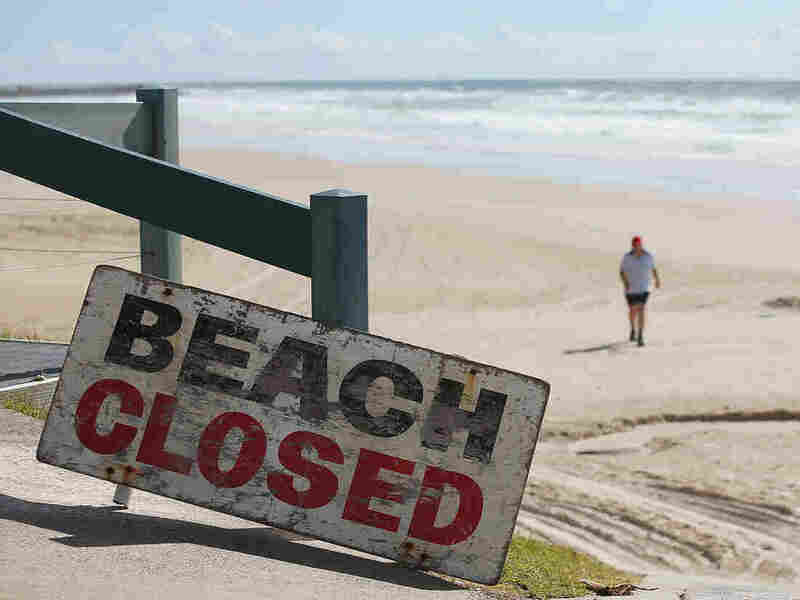 Shelly Beach in Ballina, Australia, was closed following a fatal shark encounter there in February. Part of the Australian coastline popular with swimmers and surfers will now be patrolled by drones as a way to protect beachgoers from shark attacks, government officials announced Wednesday. The trials in the southeastern state of New South Wales are part of a AU $16 million ($11.6 million) program that will test the effectiveness of drone technology in mitigating shark attacks. The drones will send real-time images of coastal waters back to an operator using GPS coordinates. "There is no easy way to reduce risks for swimmers and surfers. We are delivering on a commitment to test the best science available, including new technologies, as we try to find an effective long-term solution to keep our beaches safe." The government is also deploying a number of 4G "listening stations" that distribute tracking data of tagged sharks. Blair also announced the government will also be using physical barriers — so-called smart drum lines — during the trial. According to Engadget, the smart technologies will allow those monitoring the drums to react faster if sea creatures that pose no danger to beachgoers get hooked. "A traditional drum line consists of an anchored buoy (drum) that suspends a baited hook. Sharks are often hooked using this method, but harmless species have died due to slow response times (only dangerous sharks may be killed, often for research purposes). This "smart" apparatus equips drums with GPS and underwater cameras, allowing the people monitoring them to intervene a lot quicker." Other safety measures announced Wednesday include increased aerial helicopter surveillance — to at least three hours a day, weather permitting — along the state's North Coast, according to the statement. The Guardian reports that New South Wales has been the site of more than a dozen shark attacks this year, prompting government officials to convene "shark summits."